In as far as my own catches of bass on lures are concerned, the two sessions that I completed in the past week or so have offered me some invaluable ‘first hand’ information into the behaviour of these wonderful sporting sea fish. Generally speaking, my personal fishing time is spent experimenting – be it fishing new marks, or proven marks in different tidal or sea conditions from periods when I know they already produce, to purely utilising new lures. I love the learning aspect of everything connected to this superb method, and anything that I do learn is obviously logged meticulously so that it can be transferred to my guiding sessions and personal forays. A venue that I fish occasionally normally produces bass in the late stages of the flooding tide and immediately after high water – but only at night. And with darkness not occurring until around 2200, the fact high water was predicted to be at 2109 had me wondering if they would be there so far into the ebbing tide – but there’s only one way to find out! I arrived on the mark at dusk and just sat and watched – there were lots of grey/dark backed fish, around 6″ in length just wallowing in the shallows and occasionally breaking the surface just where the tiny waves were turning onto the shingle. I think they were immature mullet, but in the dimming light it was difficult to tell. Either way, the dark grey senko here that I attached mimicked them perfectly by fishing it for a good 30 minutes on a slow ‘straight’ retrieve, followed by a much quicker one whereby the lure would ‘skit’ briefly across the surface. If there were any bass about at that time I am sure they would have nailed it. As darkness set in, I sat high up on the shingle, ate a snack, had a drink and just chilled out for 20 minutes in order to completely rest the flat expanse of reef in front of me. It wasn’t until 2210 that I decided to make my first cast with, you guessed it, an Albie Snax. 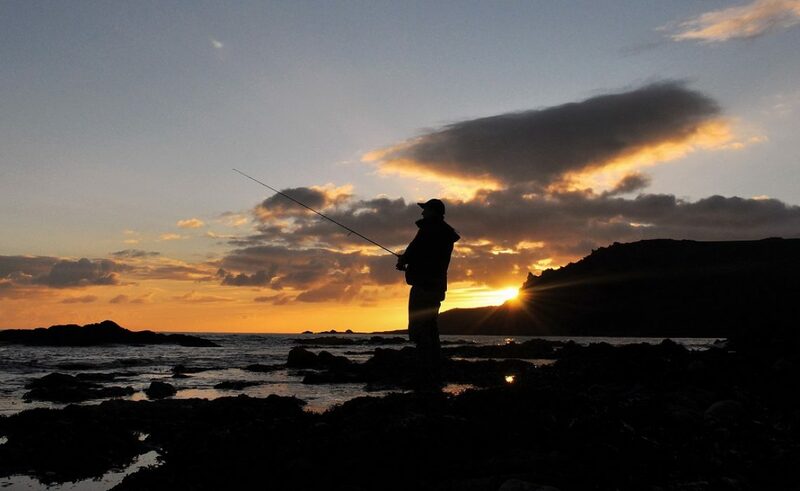 It had been a spring high tide (5.1m Salcombe scale) and the slight swell that accompanied it was now decreasing so that the sea was about as still as it gets – ideal for this form of fishing and when I’ve had my more consistent results. For a good hour, I just remained in the one position casting and retrieving in the knowledge that the bass would normally move through this area within the first hour of the ebb – but with this period having already passed, this was new territory for me; something I’m always excited about. As the 3rd hour of the ebbing tide approached, you could sense the water really beginning to strip back out from the beach and the sunken reef. ‘It’s now or never’ I was thinking as I arrowed a cast out into the still air and began to retrieve it over a feature cut into the reef before me – with the depth of water over the main platform being no more than 12″. I commenced the retrieve for the 200th time (probably) but this time, following around 10 full turns of the handle, I felt a soft ‘THUD’ followed by the rod arching over – Yes! The bass shook its head and splashed about 30m out I’d guess – was it a small one? I really wasn’t sure, but then it turned and ran to my right, taking about 3 metres against the drag in the process – this definitely wasn’t a schoolie. From that point it behaved pretty well, and on switching on my ‘full-beam’ I could see straight away that it was a decent bass. Carefully, I maintained the pressure and gradually brought it ashore about 5 metres to my right (so to not place too much pressure on the hook hold. At 60cm, I was very happy with this bass so far into the ebb tide – 2hrs 23 minutes to be precise! A nippier night to be out (hence the hat as I wasn’t feeling great with a cold) but it was 100% worth it! A couple of evenings later and with a smaller high tide now occurring firmly into darkness (a 4.6m tide at 2342) I decided to visit a mark well off the beaten track that I’ve had my eye on for some time. When you know there are bass inshore, it makes sense to venture onto pastures new, and with all the ingredients in place I was feeling better and feeling confident. With the water flooding invitingly over the reef, I commenced the session in total darkness by standing on the shingle that the water had just about reached. Again, the water here was approximately 12-18″ deep over the main platform but with a gully that runs straight into the beach a good 2ft deeper than the surrounding reef and 6ft wide my target area. Around 30 minutes in, and with my senses and levels of anticipation heightened due to the fact I was fishing alone and somewhere I’d only previously fished twice in the day, I was pleasantly surprised when a cast slightly to my right (and a deeper pool) produced a solid WHACK on the rod followed by a short burst of line being dragged off the spool. The bass had hit the Albie Snax halfway through the retrieve at a range of 20m from the beach. Unlike the bass from a few evenings before, this one decided it wanted to swim towards me – something that is a regular occurrence and which requires the reflexes of a snake! As I maintained contact, I turned on my head-torch to find this rather nice bass almost at my feet. A very satisfying 57cm bass taken from a mark that ‘looked good’ during my research of it during the winter months. This bass brought me a real sense of achievement, as I remember (vividly) standing on that very same spot at dawn one morning in late April freezing my b***s off – karma as they say! I reckon my ‘new mark’ could produce bass a lot bigger than this one! Here’s to wishing! 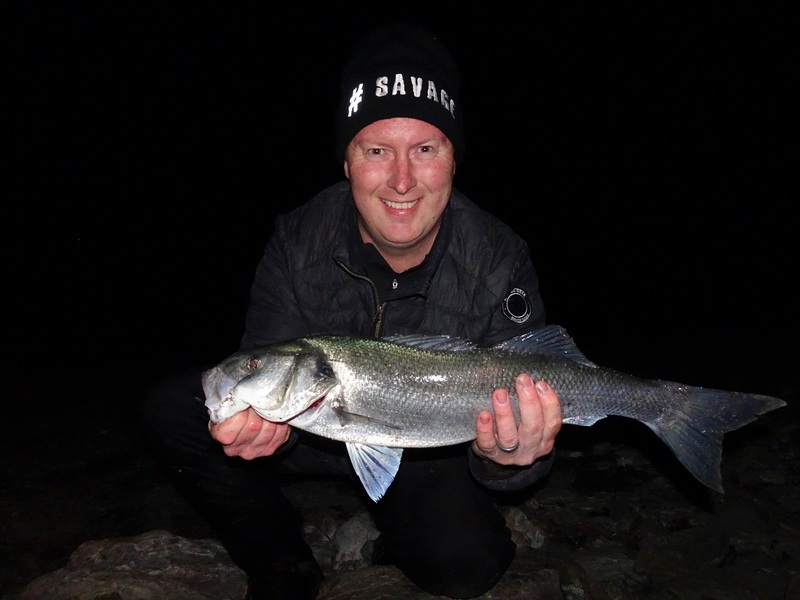 Early season can be frustrating, in that you may receive lots of ‘follows’ or perhaps catch only small fish by day – particularly when the sea is so calm and clear, which is why I have been concentrating my efforts on fishing at night. What is really interesting however is that the two fish I landed resulted from the only bites I received during the entirety of the respective sessions… I’ll take that anytime though! DISCLOSURE: If you purchase any lures or equipment using the links contained within this post then I may receive a percentage of the sale as part of an affiliate program. Using these links will not cost you any more then it would from purchasing directly from the website(s). Previous Client Catches – Salmon beat to bass on lures! Next Client Catches – Three bass and bites galore!